Well-wishers have gathered outside Everton’s Goodison Park ground in Liverpool to honour Alfie Evans. 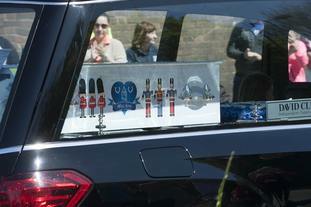 The 23-month-old’s funeral cortege passed by the football ground, where Alfie’s father Tom Evans had hoped to take the youngster one day to watch a match. Doctors at Alder Hey Children’s Hospital in Liverpool stopped providing life-support treatment to Alfie last month after his parents lost two rounds of fights in the High Court, Court of Appeal, Supreme Court and European Court of Human Rights.